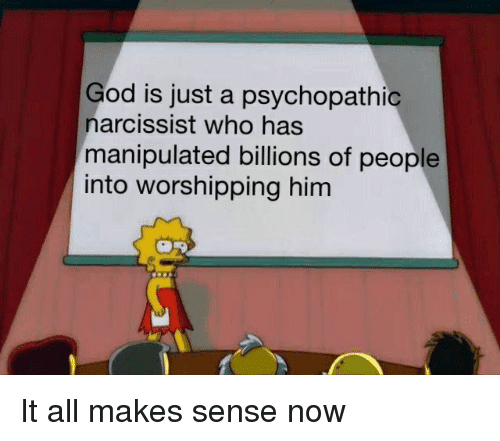 Western religions have made narcissism a virtue through the worship of God, who bears all the markers of a Narcissistic Personality Disorder. Narcissism is a painful condition of low self-esteem masked by a shallow presentation of grandiose confidence. Through their imitation of the Divine Narcissist, the religious suffer, alternating between the crushing narcissistic wounds of superiority in salvation and inferiority in sin. According to the Diagnostic and Statistical Manual of Mental Disorders (DSM) , “the essential feature of Narcissistic Personality Disorder is a pervasive pattern of grandiosity, need for admiration, and lack of empathy” (DSM-IV-TR, 714). Narcissists form a grandiose self-image as a compensatory defense in order to protect themselves from facing the pain of an actual self-image of inadequacy, which is kept out of awareness in the unconscious mind. There is no one more grandiose or egotistical (or insecure) than the biblical God. In his mind, the whole universe exists solely to worship him: “For from him and through him and for him are all things. To him be the glory forever!” (Romans 11:36). God’s idea of heaven is a universe centered around his worship: “Day and night they never stop saying: ‘Holy, holy, holy is the Lord God Almighty’” (Revelation 4:8). Yet worship is nothing more than flattery. Flattery is not befitting to spiritual leaders such as God, who should serve and set a positive example by practicing humility. Narcissists aggressively devalue or destroy those who threaten their grandiose self-image. God pours out his wrath on his followers whenever they turn their attention away from his worship. God brutally murders in hell those he considers his enemies: all Hindus, Muslims, Jews, atheists, and anyone else who lives for a purpose other than inflating his ego. In the converse of their destructive tendencies, narcissists idealize those who bolster their sense of superiority. Because narcissists’ grandiosity rests on shaky grounds, they look for the ever-elusive sense of perfection or specialness in other people and idealize them in order to identify and fuse with it. In the Bible, God idealizes brutal leaders, like Moses and King David, who, like him, extend their ego-kingdoms through violent enactment of their commands. God idealizes Jesus of Nazareth as perfect and special, even though Jesus had his flaws, like violently condemning his enemies to hell, along with anyone who refuses to worship him in the End Times (Matthew 23-24). According to the DSM, narcissists are “often preoccupied with fantasies of unlimited success, power, brilliance, beauty, or ideal love” (714). God titles himself, “King of Kings and Lord of Lords,” and describes himself as the perfection of all traits: all-powerful (omnipotent), all-loving (omnibenevolent), all-knowing (omniscient), all-present (omnipresent). This massive self-valuation surely corresponds to an equally massive low self-esteem, and a God-sized trauma behind it. Why is God so hellbent on having everyone worship him? Narcissists commonly suffer from an original developmental trauma of feeling unseen. This sense of not being seen is perceived as a threat of annihilation, the feeling that, “I am not seen; therefore, I am not real, I do not exist.” God existed in isolation, with no one to acknowledge his existence or show him empathy for all of eternity-past. What could be more traumatic? God confirms this theory of eternal isolation by telling us humans exist to reflect his glory to himself (2 Corinthians 3:18): in other words, to show him he exists forever. Perhaps all of this colossal mess that’s God’s creation has been one giant attempt at divine self-love. Why is God so hellbent on having everyone worship him?Love is, after all, profoundly difficult for a being who lacks empathy. According to the DSM, narcissists are known by their lack of empathy (DSM-IV-TR, 714). Narcissists may appear charming and benevolent at first, but they merely feign empathy in order to exploit people, whom they use as objects to get what they want. God claims to embody perfect love (1 John 4:18), yet in God’s kingdom, people are nothing more than objects employed in service of the Divine Ego. God makes this explicit in the Bible, calling humans objects and mere clay created to be glorified or burnt in hell as he wishes, just to show off his awesomeness: “But who are you, a human being, to talk back to God? ‘Shall what is formed say to the one who formed it, “Why did you make me like this?”‘ Does not the potter have the right to make out of the same lump of clay some pottery for special purposes and some for common use? What if God, although choosing to show his wrath and make his power known, bore with great patience the objects of his wrath—prepared for destruction? What if he did this to make the riches of his glory known to the objects of his mercy, whom he prepared in advance for glory” (Romans 9:20-23). Superiority or specialness is excruciatingly painful because it is impossible to achieve. Narcissists struggle with perfectionism; they tirelessly try and fail to live up to their superego’s cruel requirement of absolute perfection. The narcissist deeply loathes both himself and all other people (unconsciously) because no one is good enough; no one is extraordinary. Yet believers must try: “Be perfect, therefore, as your heavenly Father is perfect” (Jesus, Matthew 5:48). The Apostle Paul describes this agony of having to be perfect, “What a wretched man I am!” (Romans 7:24). Whenever narcissists became aware of their lack of perfection, their entire grandiose self-image comes crashing down and they experience extreme shame, humiliation, and worthlessness. This is known in psychology as a narcissistic injury. Narcissists often react to this injury like wounded animals, attempting to regain a lost sense of superiority by aggressively lashing out at others whom they perceive as easy targets, building themselves up by tearing others down. Perhaps this is why Christians so frequently display an ungodly amount of rage toward women, gays, and other innocent people. Perhaps this is why God in the Bible destroys through genocide and war people who worship other gods. If other gods are acknowledged as existing, then what makes God so special? Yet God acknowledges their existence (and appeal) in his sworn war to destroy them all: “You shall have no other gods before me… You shall not bow down to them or worship them; for I, the LORD your God, am a jealous God, punishing the children for the sin of the parents to the third and fourth generation of those who hate me, but showing love to a thousand generations of those who love me and keep my commandments” (Exodus 20:3-6). Like a classic narcissist, God defines loyalty as love, and diversity as betrayal. The solution to narcissism is an acceptance of ordinariness, of our common humanity. If there is such a thing as the supernatural, specialness, or divinity, it is a shared bond, not a dividing wedge. Therapists treat narcissists by creating a relational bond of empathy within which confrontations to the narcissist’s ego can be trusted as wounds from a friend. If he truly seeks love, let God come down from his throne and repent of his sin of selfishness, accepting his place as a god among other gods, and acknowledging his need for healing and forgiveness. Only then will he find authentic love unconditioned by fear; the love he has been desperately seeking for an eternity. Otherwise, he is doomed to an eternity-future of the clanging-of-cymbals-in-the-ears sound of meaningless worship made by narcissistic followers in heaven who, like him, are only capable of a half-hearted, self-serving kind of love. Andrew Jasko, M.Div., speaks about exposing psychological and spiritual abuses within religion and healing from religious trauma at his blog www.lifeafterdogma.org. Jasko is a former minister and psychologist-in-training.